Hon. Joseph L. Meek will live in the memory of the northwest as long as worthy descendants of noble pioneers are interested in the achievements of those intrepid men and women who gave to us this grand country. He was one of the most unique and daring characters in the entire northwest and his name is indissolubly linked with its history as his deeds and accomplishments are with its subjugation and civilization. Since it is utterly impossible for us in this capacity to give a complete history of a man of national reputation and so prominent as he, as it would take a whole volume to accomplish this interesting undertaking, we will give an epitome. Joseph L. Meek was born in Virginia on February 9, 1810, and was a cousin of President Polk. He inherited the stirring spirit of the old Virginia chevaliers and in March, 1829, went to the Rockies and for eleven years was a hunter and trapper. Personally, he was a man above six feet in his stockings, well formed and active as a deer, while his spirit never knew fear. These qualities coupled with his love for adventure and the wilds of the west led him to take hold of his chosen life with a zest and keen relish and he was always known as one of the most daring of frontiersmen, skillful and sagacious, unconquered by fatigue or hardship and always ready for the most dangerous exploit or expedition. Being well endowed with natural talent and passing a life of constant adventure and thrilling escapes, his bright memory could give the exact accounts which Frances Fuller Victor wove into the entrancing volume, River of the West. Later in life, Mr. Meek delivered a very interesting and taking lecture, entitled “From the Wigwam to the Whitehouse:” being accounts of his various experiences. At one time he held a seat in the lower house at Washington and on August 14, 1848, was appointed by President Polk United States Marshal of Oregon, it being then organized. 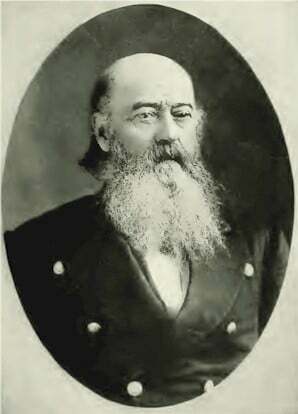 He returned to Oregon and filled the office with efficiency until 1853 and then he retired to private life. At the time of the Whitman massacre, Jo Meek was sent by the provincial legislature to Washington to announce the tidings and lay the matter before the president and also to gain such legislation as could be given for the benefit of the west. He accomplished the trip across the Rockies in the dead of winter and on to Washington in an incredibly short time, where he was a guest in the Whitehouse. His stay there is a matter of history and when the early days of autumn came, he bade farewell to the scenes of the nation’s capital, accepted the commission from President Polk, and turned his face toward the weary trials of the west and bivouacked later where rolls the Oregon, in the land where he had achieved and was to achieve much for the advancement of the country and the making of a state. Adapting himself to the cause he had taken up, Mr. Meek married a native woman, who was murdered by the Indians. He married a second time and later took as his wife a maiden of sixteen years, whom he named Virginia, in honor of his native state. She was born in the year 1820 on Clearwater River near the present site of Kamiah and was a full blood Nez Perce. To this couple were born the following issue, Courtney W., Olive L., wife of William Riley, Jennie, wife of Charles Newhard, Joseph L., Stephen A. D. They all have good allotments of land in Idaho and possess the spirit of their father. On January 20, 1875, Mr. Meek was called to depart this, life and his last hours were spent on the old donation claim in Washington County, Oregon. His wife died March 5, 1900, aged eighty; she had been a faithful companion in all his labors and achievements in Oregon.